On the background of tensions in the South of Israel, four kids from Gaza are receiving treatment at Rambam Medical Center without which they might die. At a time when rockets are being fired from the Gaza Strip at the communities of southern Israe, four young residents of Gaza are receiving treatment in northern Israel. The four kids, nephrology patients suffering from kidney insufficiency, have been hospitalized for several months in the Children's Hospital at Rambam Health Care Campus, where they have been receiving lifesaving therapy while awaiting kidney transplants. Several months ago, three of the children –– Mohamed and Hadeel (both 12) and Hadeel's brother Ahmad (15) –– recently arrived at Rambam in serious condition. Since then, they have gone from hemodialysis treatments (in which blood is cleaned via an artificial kidney) to peritoneal dialysis (administered through the abdomen). The latter therapy is given overnight, which enables patients to lead more active lives; soon, for the first time in three years, the kids will be able to go back to school like every normal child of their age. The fourth youngster, six-month-old Lian, is still being treated with hemodialysis, which is appropriate for her medical condition. Now that their health has improved, the three schoolchildren are due for release to their homes, Mohamed within the next few days, and siblings Hadeel and Ahmad shortly afterward. The families have recently spent time with the staff of Rambam's Pediatric Nephrology Unit, under the direction of Prof. Israel Zelikovic, and learned how to perform peritoneal dialysis by themselves. "Peritoneal dialysis is preferable for children because it can be performed by an automated dialysis device at the child's home, in his natural surroundings," Prof. Zelikovic says of the method's advantages. "The treatment is performed at night while the child sleeps, which frees him for regular activities during the day. It also makes possible better nutrition and metabolic balance and reduces the burden on the heart and blood vessels." According to Mahdi Tarabia, Head Nurse of the Pediatric Nephrology Unit, who has escorted the families during their stay at Rambam, until now in the West Bank and Gaza it has not been possible to receive peritoneal dialysis. "The hemodialysis treatment that these children were given before their arrival at Rambam was associated with medical complications, resulting in a worsening of their condition and many hospitalizations," he explains. "Now, these families have the skills to administer peritoneal dialysis, which represents a significant improvement in the children's circumstances and will enable them to function almost normally." The families will receive the equipment required for peritoneal dialysis and the solution used with it from Teva Pharmaceuticals, which will convey it to Erez Checkpoint. Mr. Tarabia points out the cooperation between the Pediatric Nephrology Unit at Rambam and the medical authorities in Gaza and the West Bank, who jointly have the children's best interests at heart. Over the past year, the Pediatric Nephrology Unit has cared for tens of Palestinian children from the West Bank and Gaza, who have arrived at Rambam Medical Center with various kidney diseases. The Unit, which specializes in dialysis for infants and small children, has performed more than 4,000 dialysis treatments this year. And that is a story no international newspaper or media outlet will print!!! From the Ministry of Foreign Affairs comes an interesting environmental success story. The Hiriya Recycling Park is a testament to Israel's out-of-the-box approach to greening the country. Just outside of Tel Aviv, a half-mile long landfill was once an environmental nightmare. Basically a huge mountain of smelly garbage, Hiriya wasn't the sort of place you'd want to live near, let alone visit. But today the site is used as an environmental educational facility, a natural bio-gas supplier and a transfer station. What's more, it will soon be the site of a family-oriented recycling park. Doron Sapir, head of the site, explains that 84 wells were drilled into the dump to capture the methane gas produced by the rubbish. The gas is delivered by pipe to a textile plant about four kilometers from the dump, powering the entire operation. "We are an eco-ecological facility," says Sapir, showing how all materials are separated and recycled. "What is unique here is that all over the world they are separating the waste in dry facilities, [using a] dry process. These Israeli guys thought the other way around: Not only are they not drying the waste, they are putting it into water!" Any day of the week, you can see schoolchildren of all ages come to visit and learn all about how to reduce, reuse and recycle. The World has Officially turned Upside-down. Are the French braver than the americans? The US government is making excuses for the attacks on American embassies across the Middle East, ignoring the defilement of American sovereign territory and the US flag, ignoring the flying of the enemy flag on American soil and worst of all – the murder of Americans (including a US ambassador). Moreover the government is blaming and apologizing for a silly movie that supposedly was the excuse to begin riots across the Middle East. Lynch mobs have become "demonstrators". Rioters are now "protesters". A movie is "despicable". Murder is excusable. Outrage is directed at the disrespect to Mohamed. Where is the outrage for the disrespect to America? Where is outrage for the lives of the murdered – who were murdered only because they symbolize freedom?! On the other hand there is France. Stephane Charbonnier, editor of French satire magazine Charie Hebdo knew what he was doing when he decided to publish cartoons ridiculing Mohamed. The offices of the magazine had already been firebombed once – by angry Moslems. Ever since, he's been under police protection. It seems the government, possibly the police requested that the new cartoons not be published – understandably, they did not want to have to deal with more riots and violence. Instead of being afraid, giving in, giving up, Charie Hebdo decided to publish: "When we attack the Catholic hard right...nobody talks about it in the papers. It's as if Charie Hebdo has official authorization to attack the Catholic hard right. But we are not allowed to make fun of Muslim hardliners. It's the new rule...but we will not obey it," says Stephane Charbonnier, Charie Hebdo editor. The French government resignedly announced that freedom of speech will be protected, the magazine can publish what they like and violent riots will not be tolerated. The quality of the YouTube clip or the French satire is not in question, that is not the point. They may be rude, lewd or stupid – that doesn't matter. Outrage should be at those who believe it is reasonable to murder, burn and destroy as a reaction. Outrage should be at those who use violence and threats to shut up people with a different opinion. Different opinions are important. We need to be able to voice crazy ideas. We need the silly, the idiotic, the rude and the stupid crazies because with them we get the brilliant crazies, the revolutionaries who won't sit down, shut up, move to the back of the bus. The brave and the morally correct. The trail blazers. Like the man who was brave enough to stand in front of America and the world and say that he dreams of a time when people are judged by the content of their character and not the color of their skin. And the man who decided that slavery should be abolished and that it was important enough to fight for. An entire way of life was wiped away when American slaves were freed. That was crazy – but it was also the right thing to do. Without the low you do not get the sublime. People who want to make idiotic clips or rude cartoons need to be free to do so. Without the ability to say wild things no one would ever speak of the idea that one day we would use computers that could "talk to each other" at a distance. Or ride in rolling metal boxes instead of using horses, donkeys and camels. I grew up on an America with ideals. Freedom, justice and liberty for all. Where is the justice for the murdered?! And liberty? Where has America gone? What is left? This summer, a 51-year-old Palestinian resident of the West Bank came to Rambam Medical Center for Deep Brain Stimulation (DBS) therapy in a successful bid to control the disabling symptoms of Parkinson's disease. Tarik Sadek Abu Baker, an accountant by profession, developed an aggressive case of early onset Parkinson's disease at age 39. Twelve years down the line, he had stopped responding to Parkinsonian medications. On his behalf, the Palestinian Authority turned to the Movement Disorders Center at Rambam, directed by Senior Neurologist Dr. Ilana Schlesinger. 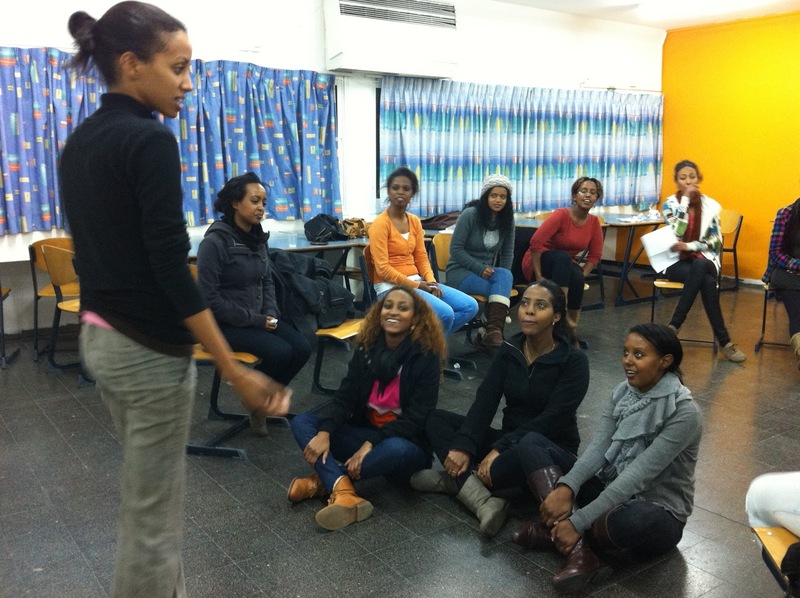 The Leo Baeck Education Center in Haifa, in partnership with the University of Haifa, provides Ethiopian students the chance to gain a higher education by fostering their leadership skills and academic excellence. The program creates a better starting point; an easier transition and integration into professional life for each participating student. With today’s troubling statistics; a mere 10% of Ethiopian Israelis have a higher education or job training, only 5% were in jobs requiring a university degree, Ethiopian Israelis receive a significantly lower salary in employment, women in particular are gived unequal opportunities and salaries; every one of these statistics is unacceptable and in light of the hard truth, the Leo Baeck Education Center is aiming to stop this downward spiral. It isn’t simply the fifteen young hopefuls that gain valuable tools, enhanced resumés, improve their employability, and become empowered. No, it is the entire Ethiopian community and general Haifa residents that benefit from the result of this program. What are the results? First and foremost, the ULTP (University Leadership Training Program) students become leaders and role models to the younger generations; lifting the whole community up. We have seen how excitement and motivation awaits the Ethiopian community; they go from a state of destitute to a state of optimism, filled with pride when they see one of their young members graduate from the ULTP program and become inspirational young leaders. What is important to note is how the program embraces traditions. Rather than attempting to discard the students cultural heritage, the Leo Baeck ULTP program gives the students the abilities to look critically at the weaknesses in their own community. They are able to create coping mechanisms to solve the problems within their own culture and community. The ULTP program has transformed the lives of many capable Ethiopian Israelis, for the past 17 years. This is one of Israel’s most pressing social issues – the integration of young people into employment and removing the barriers that persist in society. The Aleh Hanegev center http://www.aleh.org/eng/ deals with the community of disabled children and young adults. The following story relates how the new technologies are creating opportunities for development. When Gila brought her iPad to work, she never dreamed what the ramifications would be for Einat, a special-needs resident at Aleh Moriah. But this amazing gadget is now providing Einat and her friends with an entirely new window of opportunity for development and communication! Gila, an occupational therapist, had downloaded a picture application onto her iPad for her own young daughter. She decided to show it to Einat, in the hopes of provoking a reaction. Einat had never shown much motivation, or demonstrated any ability or understanding of colors and shapes, so Gila was amazed when Einat was able to ‘copy’ a picture of a house – down to the exact roof and number of windows. What made the moment more significant – Gila sent the picture to Einat’s father via email on the iPad, and Einat’s father was able to express his joy and pride on the spot, directly through Skype! Since that breakthrough moment, Einat has been able to communicate regularly with her parents in Tzfat (northern Israel), sending them photos and video messages in real time. Because they are located so far away, Einat’s parents could only travel to see her occasionally; with this newfound way of interacting via iPad the family connection has grown much stronger – and Einat has simply blossomed! Because iPads work with a simple touch screen, even the most disabled people are able to use the specialized applications and games. But beyond providing entertainment, the iPads have helped our residents uncover hidden abilities! They have shown themselves capable of drawing, interacting, choosing music, actively participating in cognitive skills-building, and independently engaging in sensory stimulation – all things they would not have been able to do otherwise. These are tough times for bigots. Speaking ill of ethnic minorities is frowned upon and hate speech is increasingly outlawed, which means there are fewer opportunities to be openly bigoted, to express naked intolerance of people who are allegedly inferior. So how are bigots supposed to get their rocks off? Fear not, they have found a way. Forced by the pressures of PC to carve out a form of bigotry that appears right-on rather than rotten, modern-day bigots are coalescing around hatred of Israel, and specifically around campaigns to ban Israeli artists and academics from coming anywhere near this morally pristine country of ours. Boycotts of everything Israeli have well and truly crossed the line from political campaigns into expressions of bigotry against the people and produce of Israel. This week, a bevy of Scottish writers became the latest to join the bigoted bandwagon, as they demanded that the Edinburgh International Festival ban an Israeli dance troupe from performing. The Batsheva Dance Company was due to perform a one-hour show at the Edinburgh Playhouse and this has riled the sensibilities of some of Scotland’s literary big-hitters. Novelist Iain Banks, poet Liz Lochhead, short story writer AL Kennedy and others had a letter published in this morning’s Glasgow Herald in which they demanded that Batsheva be banned from Edinburgh on the basis that it is a “global ambassador of Israeli culture”. Well, we can’t have any of that toxic Israeli culture infecting Edinburgh, can we? This highly intolerant effort by one group of artists to have another group of artists banned – or perhaps quarantined at the borders until they renounce their home country and everything it stands for – is part of a bigger chattering-class trend to ghettoise Israeli culture. Earlier this year, actress Emma Thompson and other luvvies sought to have the Israeli theatre company Habima banned from taking part in an international Shakespeare festival at the Globe Theatre in London. They accused the Globe of “associating itself with policies of exclusion practised by the Israeli state”. Last year, the Israel Philharmonic Orchestra was loudly jeered as it performed at the Proms, by people who think that even beautiful music can be evil if it is performed by Them, people who hail from Israel. Click here to watch the orchestra struggling to be heard over the din of the jeering – it’s a depressing spectacle. Meanwhile, no decent, politically aware household in the leafier bits of Britain will have any Israeli produce in its fridge or larder. Not buying Israeli figs is one of the main ways that certain sections of society express their probity these days. Outside Marks & Spencer on Oxford Street, you will often see a group of keffiyeh-wearing radicals holding a banner saying “Boycott Marks & Spencer” in dripping, blood-red writing. They never picket other shops that sell Israeli produce, such as Sainsbury’s or Tesco. Only Marks & Spencer. I’m sure that has nothing to do with the fact that Marks & Spencer was founded by J*ws. The Israeli boycotters and banners always present their campaigning as politically informed, as a well-thought-through attempt to shame Israel and champion the Palestinian cause. They depict their erection of an anti-Israeli forcefield around Britain as an attempt to challenge what they call “Israeli apartheid” – the irony being that, in the process, they practise cultural apartheid against Israelis, against dancers, musicians and thinkers whose only crime is to have been born and trained in Israel. But there is nothing political about these censorious efforts to keep everything Israeli out of Britain. It is just an acceptable form of bigotry, a way of advertising one’s own moral decency by contrasting oneself to an inferior, infected people from Over There.